My wife and I have been taking advantage of the summer lull and catching up on some movies we’ve had lying around the house for a while. The other night we finally watched Batman Begins. The movie where we get the theatrical rendition of the start of Bruce Wayne’s new persona and his training in ninja skills. After the movie I got to thinking about what ninjas are about, and how the church mirrors them. 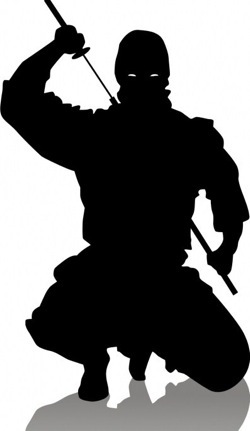 Ninjas are trained for missions in espionage, sabotage, assassination and countermeasures. They learn how to blend in and not be noticed. Today we picture them dressed all in black and jumping out of trees and buildings. How is that blending in? If you saw someone shrouded all in black from the top of their heads to the tips of their toes, they wouldn’t exactly blend in now would they? Ninjas are trained in the art of disguise, meaning they look just like everyone else. You can’t pick them out from anyone else on the street. See where I’m going with this? It seems many of our churches have mastered this art. No one can pick out the Christians in the streets. We look and act just like everyone else. Is this what we are supposed to be doing? Doesn’t the Bible tell us to be light in the darkness, to shine for all to see? To stand out in the crowd so that everyone can learn about the abundant grace God offers all people through Jesus Christ? Growing up, there were times when I thought I wanted to be a ninja (don’t all boys at some point? ), now I think I might need to try and stand out more so people can learn more about this amazing gift God offers us all.